Claire Leonard, PAWS Board member and head of PAWS half way house for doggies, went to Peyton, Colorado in Nov 14 to help the National Mill Dog Rescue rescue 87 doggies from puppy mills. A breeder from one puppy mill surrendered an 8 year old doxie who had been in a cage all her life. CLAIRE ADOPTED HER! She was like a "zombie!". Her eyes look less sad now as at last she has a good life. She following Claire everywhere she goes. Peyton will be 10 in April. Let's celebrate by donating in Peyton's honor to help rescue more animals. God Bless our "Saint Claire!" Amazon donates 0.5% of the price of your eligible AmazonSmile purchases to the Pecos People for Animal Welfare Society. 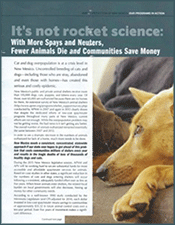 Cat and dog over population is at a crisis level in New Mexico. Uncontrolled breeding of dogs and cats-including those who are stray, abandoned and even those with homes, has created this serious and costly epidemic. 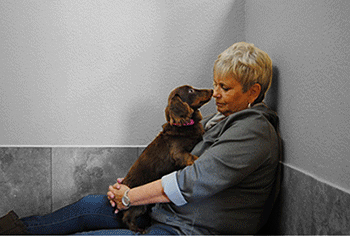 New Mexico's public and private animal shelters receive more than 135,000 dogs, cats, puppies, and kittens every year. Of those,over 65,000 are euthanized because there are no homes for them. June 1ST, 2013, PAWS held a very Succesful Fundraiser, Over 100 supporters were in attendance and a good time was had by all. Ticket sales and donations yielded sufficient funds to put the Spay/ Neuter Surgical Van on the road for a good number of days in rural areas which is much needed activity over the summer for our organization. 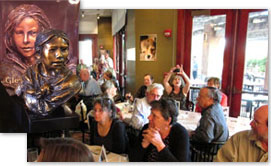 A lovely bronze sculpture "Ciquala" ("Little One" in Dakota Sioux) donated by world reknowned artist Glenna Goodacre, was won in the ticket raffle by attendee Terry Fehr. PAWS, as a member of the Companion Animal Alliance of Northern New Mexico, is the recipient of a Maddie's Fund Grant. The funds will help PAWS and the Alliance work closely together to better the lives of all animals in Northern New Mexico. The $30,000 grant was shared among participating Alliance members, including Santa Fe Animal Shelter & Humane Society, Espanola Valley Humane Society, Las Vegas Animal Control, Felines and Friends, Four Corners Animal League, Heart & Soul Animal Sanctuary and People for Animal Welfare Society(PAWS). The Maddie's Fund mission is to revolutionize the status and well-being of companion animals. Jane Carson was awarded the Milagro Award for Humane Citizen. The $30,000 grant was shared among participating Alliance members, including Santa Fe Animal Shelter & Humane Society, Espanola Valley Humane Society, Las Vegas Animal Control, Felines and Friends, Four Corners Animal League, Heart & Soul Animal Sanctuary and People for Animal Welfare Society(PAWS). Humanitarian Lessons Pave the Way for Kosovo's First Animal Shelter. 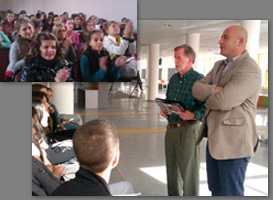 As featured in today's Albuquerque Journal, APNM's Board of Directors member, Tom Alexander traveled to southern Kosovo last November to teach school children that, with empathy and care, dogs and cats can become loving companions and to educate municipal leaders, of the need for a community animal shelter.